Publishers, librarians, funders and researchers are faced with the task of evaluating academic journals. Journals have often been ranked using misapplied metrics or through a single indicator used without appropriate context. The latter usage is controversial as a single indicator only measures one aspect of journal performance and is subject to interpretation. For a more meaningful analysis, a range of different measures should be used, combining both productivity (such as document and citation counts) and also normalized values for wider comparisons and contextualization. Analyses at the journal level should consider the impact of individual published articles. As citation-based measures look at a single aspect of article performance, a more thorough analysis should include a wider set of quantitative and qualitative measures. Journal performance evaluation can be difficult and the indicators used are often contentious.1, 2 Traditionally, it has relied heavily on citation metrics. In recent years the pool of data available for journal analysis has widened and deepened, to include article downloads and page views, as well as social, online and other media interest (generically labelled ‘altmetrics’). At the same time, reactions to citation-based indicators have polarized, often denouncing the misuse of these indicators for tasks such as evaluating researcher performance and output, culminating with the San Francisco Declaration on Research Assessment (DORA).3 Other criticisms have pointed to methodological issues and that journal-level indicators do not adequately reflect the performance of individual articles.1, 4 Citations represent one aspect of article and journal performance, but provide a clear and quantifiable measure of activity. So the question remains: what is the best way to evaluate a publication? More widely, there are questions around how we evaluate and benchmark not just publications, but also institutions, countries and individuals in meaningful ways. 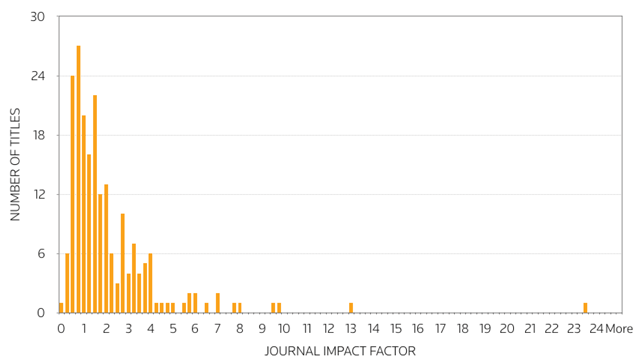 Much discussion of research and journal evaluation has centred on the use of a single indicator such as the journal impact factor (JIF). However, no single indicator, even a valuable one, will provide an adequate measure of journal or article performance. Understanding and combining metrics may provide an avenue to more meaningful journal performance evaluation. Indicators derived from citation counts are only as reliable as the data set. Citation-based indicators derived from different data sets should not be directly compared since citation-based indicators reflect the extent of the coverage, selection and editorial policies of the underlying data set. Citations measure one particular aspect of ‘performance.’ They may be positive (‘this supports our idea’), negative (‘we are disproving this’), or indifferent (merely citing some commonly used methodology). So, citations do not represent a recommendation, but they do represent a countable use. Citation patterns favour a small number of heavily cited articles. The ‘inherent value’ of usage is as difficult to define as any other measurement. Articles may simply be added to citation management tools and other databases, and care must be taken by systems not to count automated activities. Altmetrics, defined in this case as ‘non-traditional’ metrics, have been proposed as an alternative to established citation-based measures.8 They typically focus on the article and the same methodologies are being extrapolated to evaluate people, institutions, regions and other entities. Altmetrics are now widely available (ImpactStory, Altmetric.com, Plum Analytics, PLOS Metrics) and are used by several publishers. Altmetrics benefit from immediacy, since interest can be measured from the point of first publication, often online. The JIF remains a widely adopted and respected indicator of journal ‘quality.’ As a result of this, authors often find themselves pushed towards publishing in ‘high impact factor journals.’ Articles accepted by highly respected journals have clear merit, but this may be used as a proxy to measure the research performance of individuals despite clear statements against this type of usage.10 JIFs have the benefit of being simple and appealing; however, like any other metric, they must be seen in context. The JIF offers a two-year snapshot of citation activity. It is a numerical calculation dependent on the accuracy and source of citation counts, the material selected for inclusion in the calculation, and subject categorizations. It is not a direct measure of quality; it is a defined measure that shows relative average citation performance of a journal within the measurement period. The JIF provides a window into citation activity within an editorially defined field and is applied at the journal level. Comparisons cannot be made between fields and it implies no representations at the article or author level. JIFs, like other indicators based on an arithmetic mean, can be skewed by small numbers of highly cited articles or other outlying data points. comparative and normalized (percentiles, normalized citation impact, influence). Productivity metrics measure output and include: number of papers published, times cited and derivatives of these measures. They provide quantitative data underlying performance trends but cannot be used to compare across disciplines or timeframes. Indicators such as the JIF or h-index are based on productivity measures. These indicators can benefit from an understanding of the distribution of values (Figure 1), for instance through calculating the JIF percentile. This converts the rank of a JIF in its category to a percentile and shows clearly how a journal compares with its peers. Percentiles can be used to compare ranking across and within categories rather than merely stating the numerical value. 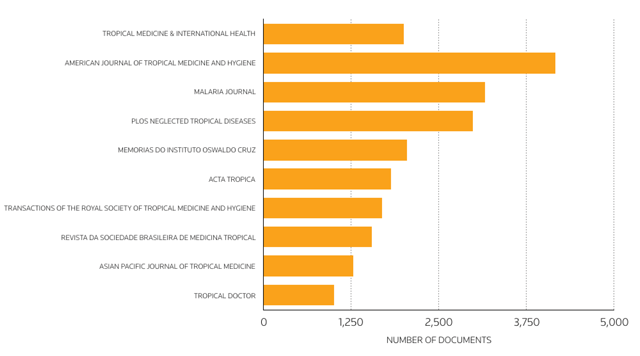 Tropical Medicine and International Health has a JIF of 2.329 (JCR 2014 Edition). Alone, all this value tells us is that a paper published in the journal during 2012–2013 was cited on average 2.3 times in 2014. As an average this tells us nothing about individual articles or how the journal compares with other titles. The metric trend shows how the JIF has changed over time (Figure 2). Only an additional context can explain the trend, since any increase or decrease may follow an overall trend in the subject area. This approach illustrates the effect of category selection. The title is ranked fourth in ‘Tropical Medicine,’ but 51st in the larger ‘Public, Environmental & Occupational Health’ category (Table 1). Intra-category comparisons compare titles like-with-like but depend on the category designation. Productivity measures such as number of documents can add another dimension, demonstrating overall contribution to the field (Figure 3). By considering more indicators, a better understanding of journal performance can be achieved. This approach is not limited to JIFs. Any indicator can be ranked against its peers and put into the context of overall output in a subject area or other grouping (Table 2). The example above considers comparisons with titles publishing in the same field. These comparisons offer only a small window on possible wider comparisons. A vital tool for making meaningful comparisons of citation-based indicators is normalization. Citations rates vary by subject, over time, and by document type (Figure 4). Journals in different subject areas cannot be directly or accurately compared. Citation rates differ, not just initially but over time. Even within categories, article types are cited differently, and reviews are more highly cited than original research. Some article types, like proceedings papers and book reviews, may accumulate far fewer citations or sometimes none. Normalization helps account for these variables. There are several normalized citation metrics available, including Category Normalized Citation Impact (CNCI) and Journal Normalized Citation Impact (JNCI). 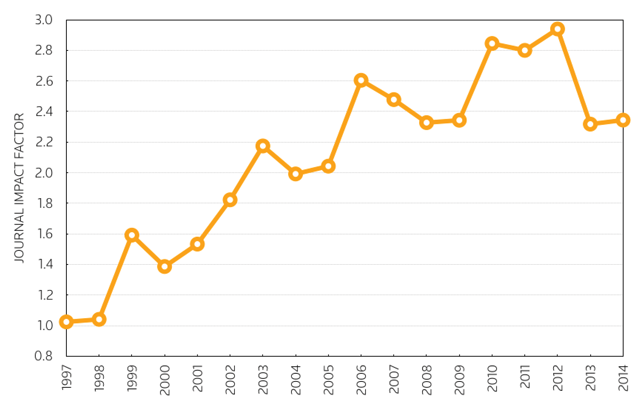 Using normalization, the average number of citations for a document type published in the same year and in the same journal or category can be calculated (Figure 5). This can be compared with the actual number of citations received by an entity (article, journal, person, institution, etc.). The resulting simple ratio shows whether more or fewer citations than expected are being received. This technique can be used for journals, individuals, institutions, countries, subject areas, and other groupings. As ever, for metrics, the data set, coverage and accuracy of indexing must be considered. Normalized Citation Impacts are derived from article-level calculations, allowing the individual contributions to be analysed and benchmarked. Article-level views reveal those papers (and their authors) that have contributed to the title’s citation impact. Care should be taken with interpretation. Normalized Citation Impacts are based on arithmetic means and can be skewed by very highly cited papers, especially in small analysis sets. A single paper may have a very high normalized citation impact. Also, recently published articles may produce value ‘spikes,’ particularly in fields with low citation rates. Setting appropriate analysis thresholds can exclude outlying data points and help avoid such effects. The contributions of individual papers should always be analysed to complement journal-level calculations (Table 3). Analyses such as this can provide a framework for a more meaningful journal performance analysis. Comparisons require normalization and other tools to account for variability in citation rates between different subjects and over time. Combining productivity measures with derived indicators such as JIFs, rankings and percentiles, and then adding context using normalized impact metrics, such as CNCIs or JNCIs provides an informed assessment. A comprehensive suite of bench-marking and analytical tools can reduce or eliminate biases and extend understanding. Interpretation requires an understanding of what each metric tells us, how it is calculated, and the data set from which it is derived. Assumptions made in any interpretation should be stated. No metric offers a single, unambiguous measure of performance or quality. When examining journal performance, it is important to remember that a journal is the sum of its articles, and citations are generally distributed across a smaller number of papers. Journal analyses should always be conducted down to the article level to understand the contributions of individual articles. Using a range of indicators can help avoid misleading conclusions. Developing an understanding for the sensitivities of individual metrics and the combining of relevant indicators leads to informed analyses. Citation-based metrics, usage metrics and altmetrics complement one another. On their own merits, each can illustrate different aspects of a performance. In combination, they can offer a strong and diversified foundation for analysing journal performance and help guide decision-making for publishers, librarians, researchers and funders. The author is an employee of Thomson Reuters, who provide information for businesses and professionals, including the Web of Science citation database and a range of benchmarking and analytical solutions. The examples in this article used InCites™ Benchmarking & Analytics. Thanks to Tom Zamojcin, Guillaume Rivalle and Jennifer Minnick for their input, suggestions and discussion. San Francisco Declaration on Research Assessment (DORA) (). 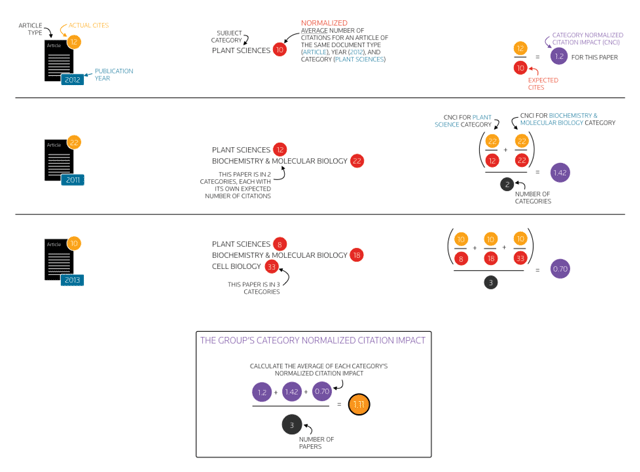 http://www.ascb.org/files/SFDeclarationFINAL.pdf (accessed 10 February 2016). Pulverer, B (2015). Dora the Brave. EMBO Journal 34(12): 1601–1602, DOI: https://doi.org/10.15252/embj.201570010 (accessed 10 February 2016). Counting Online Usage of Networked Electronic Resources (COUNTER) (). http://www.projectcounter.org/ (accessed 10 February 2016). Anonymous (Editorial) (2012). Deciphering citation statistics. Nature Neuroscience 11(6): 619.DOI: https://doi.org/10.1038/nn0608-619 (accessed 10 February 2016). Priem, J, Taraborelli, D, Groth, P and Neylon, C (2010). Altmetrics: a manifesto. October 26 2010 http://altmetrics.org/manifesto/ (accessed 10 February 2016). Eysenbach, G (2011). Can Tweets Predict Citations? Metrics of Social Impact Based on Twitter and Correlation with Traditional Metrics of Scientific Impact. Journal of Medical Internet Research 13(4): e123.DOI: https://doi.org/10.2196/jmir.2012 (accessed 10 February 2016). Thomson Reuters Statement Regarding The San Francisco Declaration on Research Assessment (). http://researchanalytics.thomsonreuters.com/statement_re_sfdra/ (accessed 10 February 2016).